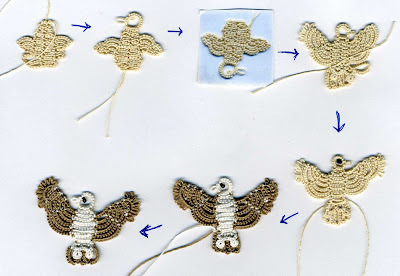 Another pattern progression for you. The story thus far: I had failed at making a maple leaf, but thought the shape suggested an eagle. My first attempt to turn it into an eagle led instead to a baby bird. Now it's time to try to turn that chick into an adult eagle. Again I let the shapes speak to me, to suggest what they wanted to be. I know it sounds funny, but it's hard to describe. Think of it as doing "free association" but with shapes instead of words. I decided that the key to the eagle was to turn the wings upside down. I was very pleased with the next draft, despite a mis-start with the tail. From there, it was just tweaking for the final shape. Designers's trick: note how some of the birds have two different wing treatments. If it's not going to be a final draft, a piece doesn't have to be neat or symmetrical. By trying different things in the same piece, you can cut down the number of drafts. I once made a snowflake with 5 different points. Better to have one really ugly one than to make five separate ones before getting it right in my opinion. Those of you who guessed I saw a bird here were right on the money, so give yourselves a pat on the back. Actually, I looked at the first rough draft (the failed maple leaf, remember) and thought I saw an American eagle. I worked another draft, but it looked more like a baby bird than an eagle. But that's OK, a baby bird might be useful. Then it's just a few tweaks for shaping. Note how I begin working in cheap, plentiful "ebay ecru" and switch to the good thread as I get closer to the end. I wonder if there's still an eagle in there somewhere. Sometimes rough drafts are really, really rough. 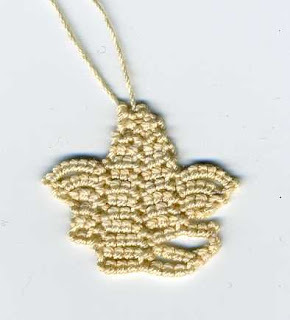 I was trying for a maple leaf, but this is just dismal, even by first draft standards. But--I think I see a different shape hiding in there, trying to get out.